In ENDEAVOR (NCT01568866; N=929), carfilzomib plus dexamethasone (Cd) was superior to bortezomib/dexamethasone (Bd), with a 2-fold improvement in median PFS (18.7 vs 9.4 months; HR=0.53; 95% CI, 0.44, 0.65; p<.0001) in patients with RMM. To evaluate change from baseline in left ventricular ejection function (LVEF), right ventricular (RV) function and pulmonary artery systolic pressure (PASP) via echocardiogram (ECHO) in a subset of patients from the ENDEAVOR study. Adults with RMM (1–3 prior regimens) with a LVEF ≥40% and no evidence of New York Heart Association class III or IV symptomatic heart failure (HF), symptomatic ischemia, uncontrolled arrhythmias or recent myocardial infarction within 4 months before randomization. Patients received either carfilzomib (30-min IV infusion on days [D] 1, 2, 8, 9, 15, 16 [20 mg/m2 on D1, 2 of cycle 1; 56 mg/m2 thereafter]) and dexamethasone (20mg on D1, 2, 8, 9, 15, 16, 22, 23 of a 28-day cycle) or bortezomib (1.3 mg/m2; IV or SC on D1, 4, 8, 11) and dexamethasone (20mg on D1, 2, 4, 5, 8, 9, 11, 12 of a 21-day cycle). All eligible patients were assessed at baseline and every 12 weeks on D1 of treatment cycles and at the end-of-treatment visit (using 2D transthoracic ECHO). ECHOs were centrally read. An independent cardiac events adjudication committee (CEAC) reviewed results in conjunction with adverse events (AEs) to assess clinical significance. Primary endpoint was reduction (≥10% absolute decrease from baseline in patients with LVEF ≤55% or a reduction <45% for patients with baseline LVEF >55%) or no change in LVEF (≤24 weeks from baseline). A total of 151 patients (Cd: 75; Bd: 76) were included in this substudy; 74 in each arm were evaluable for safety. More patients in the Cd arm (versus the Bd arm) were aged ≥75 years (21.3% vs 14.5%), had prior cardiac-related medical history (26.7% vs 14.5%) and received drugs for obstructive airway disorders (28.0% vs 17.1%). Patients in the Cd arm had a higher incidence of HF reported as an AE vs Bd (10.8% [n=8] vs 4.1% [n=3]), consistent with the overall safety population (8.2% vs 2.9%). History of cardiac disorders was associated with an elevated (not significant) risk of HF (3/8 Cd pts; 0/3 Bd pts). Patients receiving Cd had a higher incidence of hypertension (HTN) versus those treated with Bd (20.3% vs 8.1%). Twenty-three patients (15.2%) discontinued treatment due to AEs); 8 due to non-fatal cardiac-related AEs (6 Cd [2 due to LV dysfunction, and 1 each due to HF, decreased EF, pulmonary embolism, and ischemic stroke] and 2 Bd [1 each due to decreased EF and RV failure]). 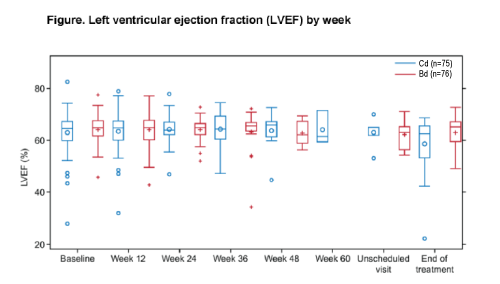 Only 1 patient (Bd) had significant LVEF reduction as defined within the first 24 weeks. Six patients had a significant LVEF reduction at any time during the study (Cd: 3; Bd: 3). All but 1 had resolution to normal LVEF. CEAC evaluation found 14 patients (Cd: 8; Bd: 6) had on-study CEAC-defined clinically meaningful changes in ECHOs; 11/14 (79%) did not meet the ECHO criteria for decreased LVEF. The CEAC reported more Cd patients (vs Vd) had evidence of HF (n=4 vs n=0) or pulmonary HTN (n=4 vs n=1). In the overall and cardiac substudy, HF and pulmonary HTN events occurred more frequently with Cd vs Vd although ECHO-detected significant decline in LVEF was low on both treatment arms and with similar frequency. The substudy found limited utility for serial screening with ECHOs to mitigate cardiac risk for unselected patients receiving carfilzomib. Alternative surveillance strategies are needed to detect early cardiotoxicity and prevent treatment interruption or discontinuation.